Three tall grain storage pots with three legs incorporated at the base standing at the edge of a homestead near a recently harvested garden area. Cattle were brought back from early dry season grazing to feed on the stalks. The location is noted as Western Nuerland and relates to Evans-Pritchard's 1936 fieldwork which began in October of that year, soon after the millet harvest. Note on print reverse ms pencil - "2 W.Nuer" & print front border ms ink - "NUER XII/98"
Morton, Chris. 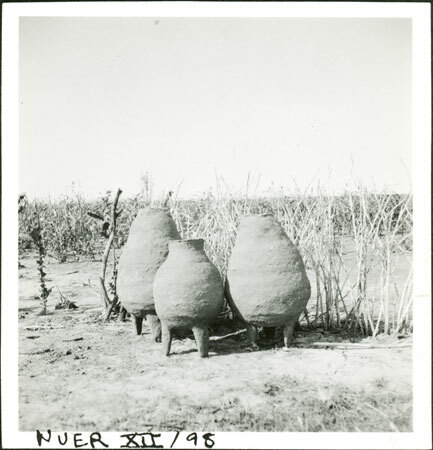 "Nuer storage pots" Southern Sudan Project (in development). 03 Jan. 2006. Pitt Rivers Museum. <http://southernsudan.prm.ox.ac.uk/details/1998.355.599.2/>.